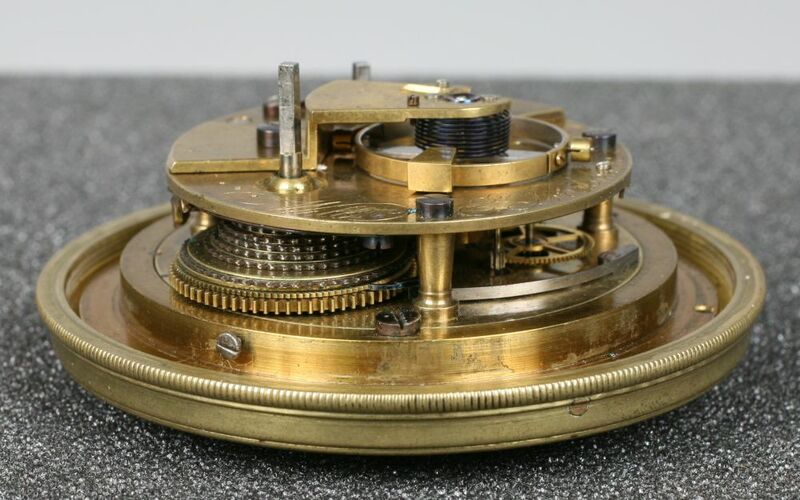 William Edward Frodsham Two-day Marine Chronometer, No. 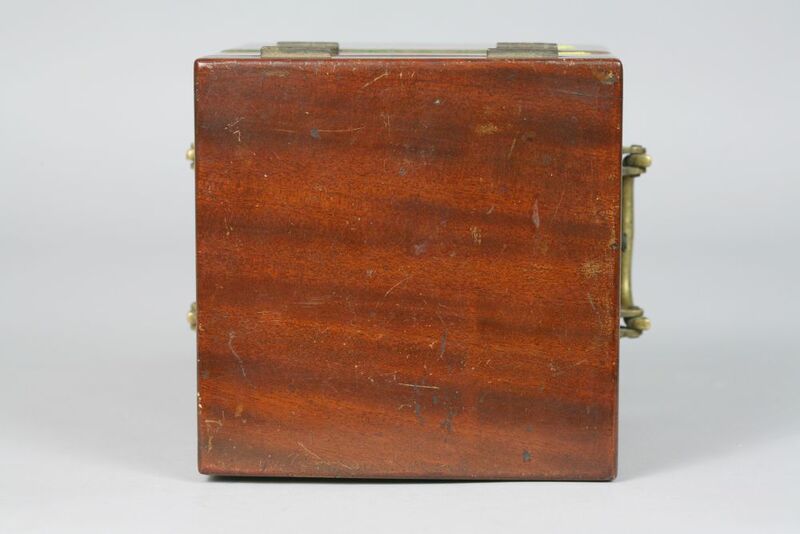 1, Change Alley, London, c. 1823, the two-tier mahogany box opens to the printed label under the lid stating in part Parkinson & Frodsham, Chronometer Makers to the Right Honorable, the Lords Commifsioners of the Admiralty & Honorable C.M. Company, 4 Change Alley, opposite the South Gate, Royal Exchange, London..., 3-in. silvered engraved Roman numeral dial marked Will (m). E (d). Frodsham/Eleve of/Parkinson & Frodsham/Change Alley/London/No. 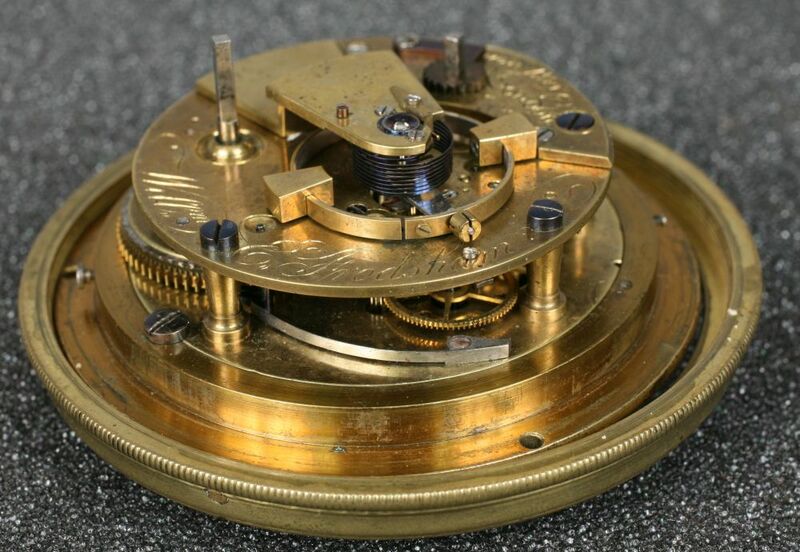 1, seconds dial and blued steel hands, gimbaled and movement mounted in a brass bowl, three quarter brass plate chain fusee movement signed Willm. 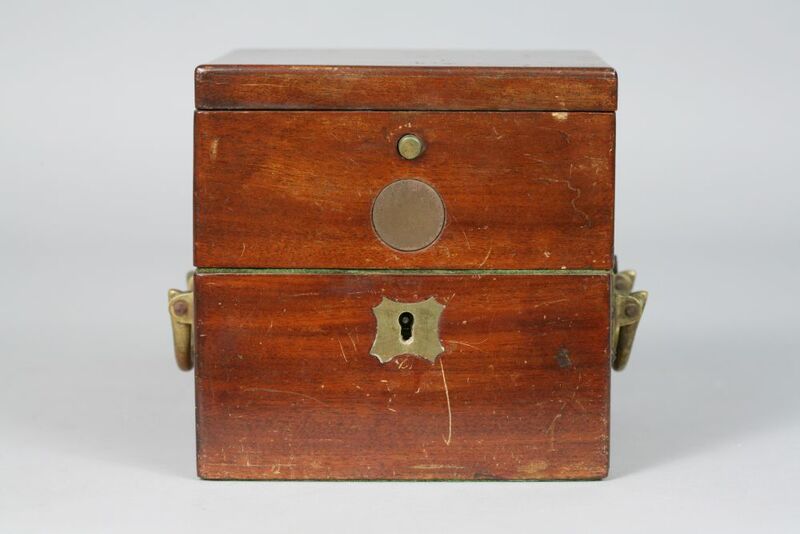 E. Frodsham/Change Alley/London, spring detent escapement, two-arm split balance with two brass timing screws and wedge-shaped weights, helical hairspring, diamond endstone, and maintaining power, all in a two-tiered mahogany box with bail carrying handles, vacant number boss and brass escutcheon, ht. 6 1/4, wd. 6, dp. 5 3/4 in. 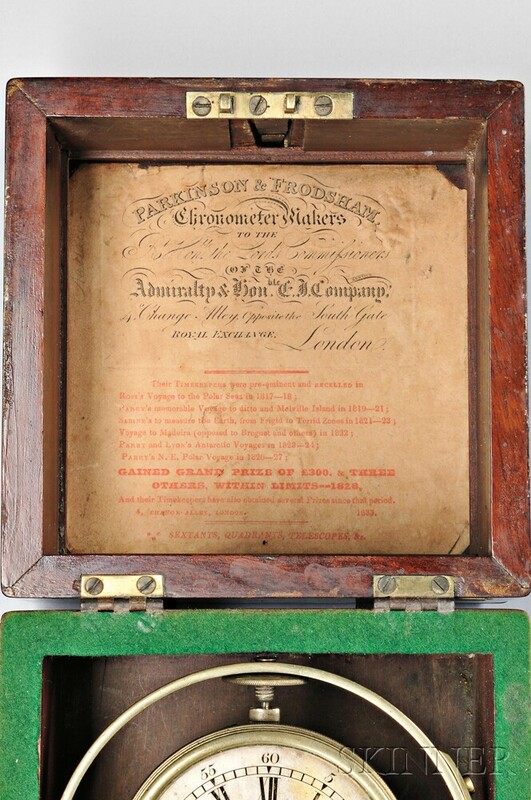 Note: William Edward Frodsham (1804-1825) was the son of William James Frodsham (1779-1850) and the student, or "eleve" as engraved on the dial, of Parkinson & Frodsham. 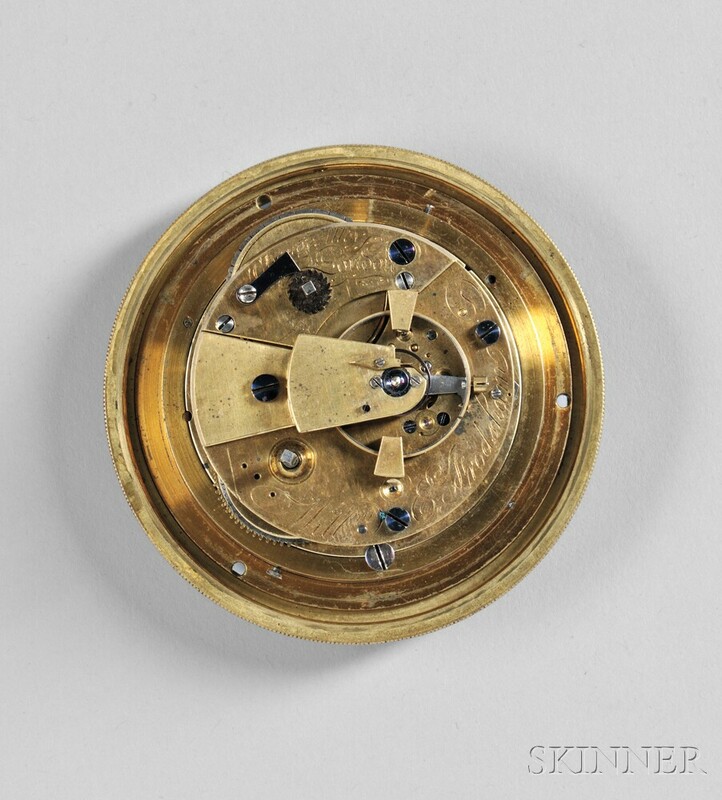 William Edward was about 20 years old when he made this, his first chronometer and died a year or so later from drowning while bathing. 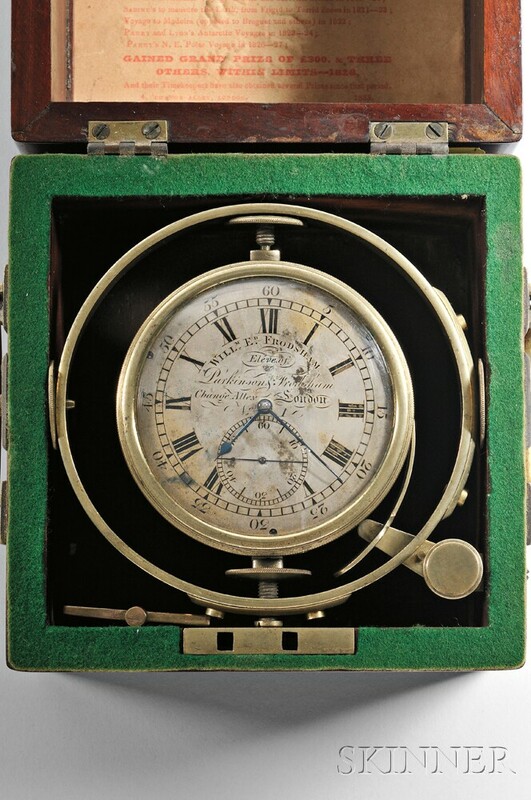 The present timekeeper was used on voyages of exploration to the Arctic Circle in 1823 to Spitzbergen, Norway, and in 1824 to Repulse Bay, Canada. 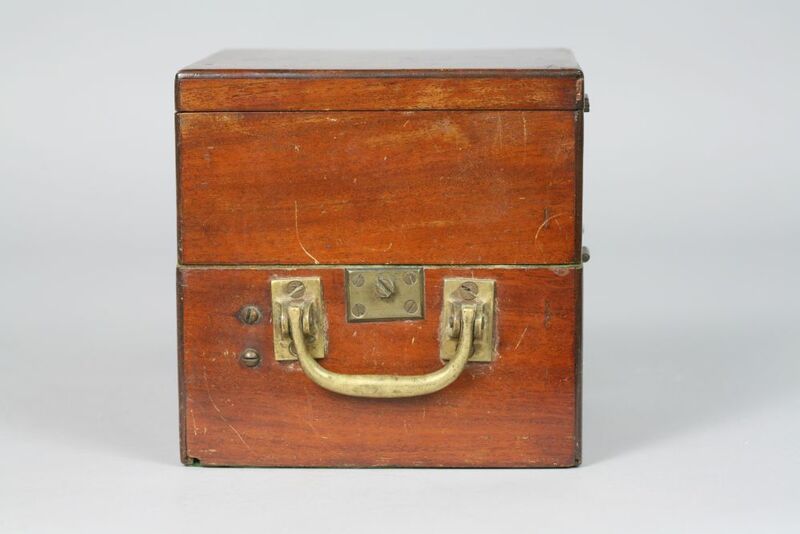 Its whereabouts since 1900 have been unknown until recently discovered by Skinner. 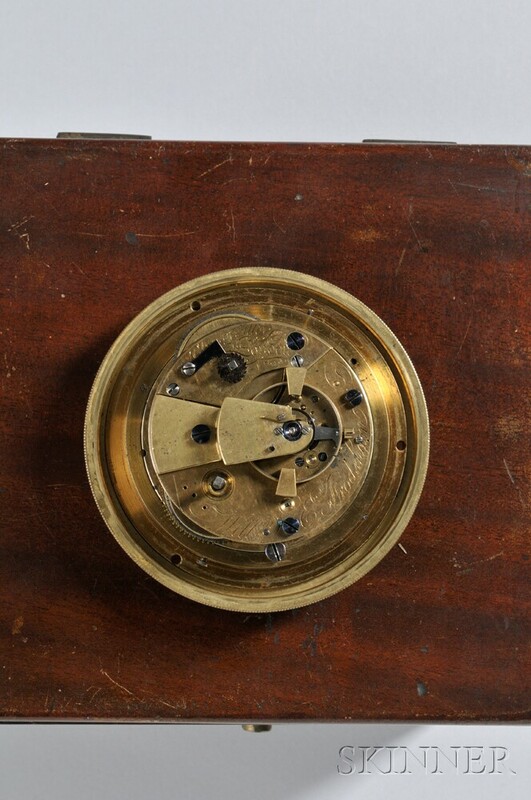 William Edward's second chronometer traveled in much more temperate climates. No. 2 served 80 years with the Royal Navy including service on the HMS Beagle carrying young naturalist Charles Darwin on a five-year voyage. Darwin's notes on this voyage eventually became The Origin of the Species. 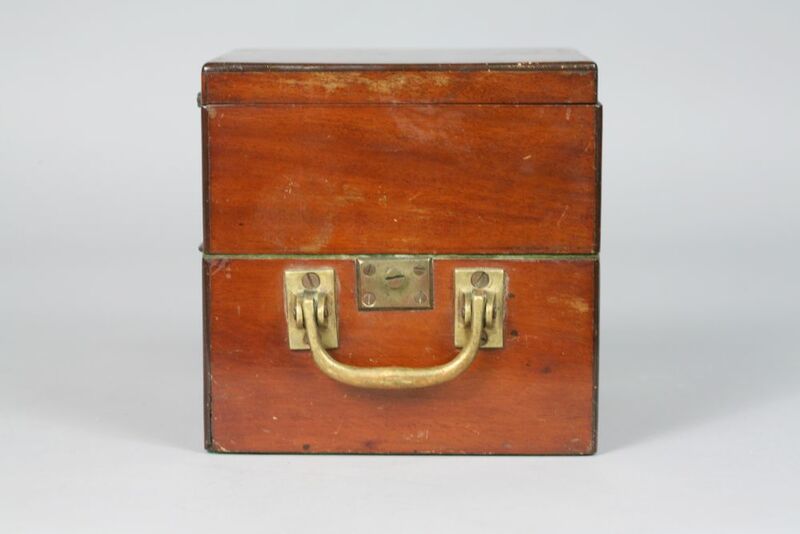 Movement runs briefly , but stops; found in an attic where stored for a generation and no doubt can use an overhaul., brass elements in old lacquered surface, silvered dial with age consistent discoloration, appears to retain the original hands, label on underside of lid in excellent condition with minor lifting, mahogany box in old surface with minor scratches and dings.